A perfect one step product to clean and protect your seats, dashboard, console, doors, arm rests, trim, etc. This do it all cleaner and protectant will help you maintain your leather, vinyl, rubber and vinyl surfaces. It starts off with light cleaning agents to safely remove dust, dirt, human oils and more. It then leaves a coating of penetrating oils and UV inhibitors. The oils help safely condition the surface to prevent cracking and premature fading. The UV inhibitors block out harmful UV rays so your seats, dashboard, doors, moldings, trim, etc. look like new again. The Protectant Plus leaves a satin like finish that is not glossy or oily at all! Instead this formula has been specifically designed to be absorbed into the surface which helps fill in small surface imperfections while leaving a silky smooth finish. It will also help repel dust with it's anti-static properties, so any surface you spray it on will look great for longer. Simply spray it on the desired surface or on a microfiber towel, wipe the desired areas and you are all done. Like most Optimum products this product uses no VOC's or solvents and is environmentally responsible. It's great on virtually all seats because of the strong protection and matte finish. It's so good on leatherette and leather surfaces it's also known as the Optimum Leather Protectant. The Optimum Protectant Plus is the ultimate interior product that has everything you want! 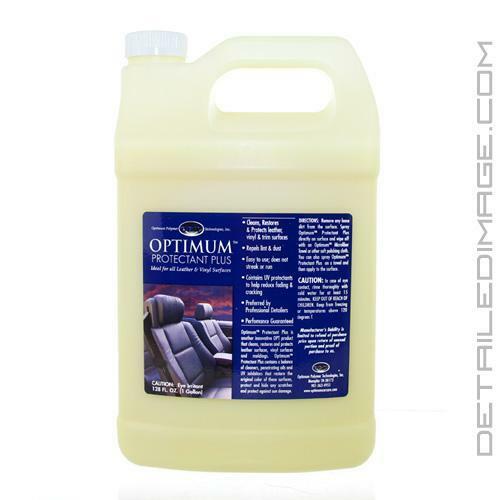 Optimum Leather Protectant is another innovative OPT product that cleans, restores, and protects leather surfaces, vinyl surfaces, and moldings. It contains a balance of cleaners, penetrating sealant polymers, and UV inhibitors that restore the original color of these surfaces, hide scratches, and protect against sun damage. Contains UV protectants to reduce fading & cracking. Remove any loose dirt from the surfaces. Spray Optimum Leather Protectant directly on surface and wipe in with an Optimum Microfiber Towel or other soft polishing cloth. You can also spray Optimum Leather Protectant on the towel and then apply it to the surface. I use this on all the surfaces of the interior on my car, including the dash, leather wrapped steering wheel, door panels and seats. It does not leave a greasy film nor a glossy finish. I spray the product on a microfiber applicator and spread on the surface. It leaves a nice, rich treated look. It makes the leather seats feel supple and refreshed. The smell is not bad and doesn't last long. Use can either buff after applying or just leave it. Optimum makes some great products. First off, I used power clean as a first step, then followed up on the Audi leather seat with optimum leather care. First impression is that the product didn't spray out if the bottle in a spray pattern that I expected. It mainly just steamed out in a thick squirt. The next thing I noticed was the leather scent. The third thing I noticed was how easy it was to spread onto the leather and how it didn't make the seats look dark or greasy like 303 did. This is where it gets interesting. Originally, I cleaned the seats last year and tried 303 as the leather protectant. 303 on the leather was a big mistake. That's when I bit the bullet and went with optimum power clean on the seat in an effort to remove 303. That worked, but I didn't have a protectant to apply after using power clean. That's where optimum leather care comes in. The leather care provided a finish and a leather scent that makes the Audi feel like it did when new 10 months ago. The power clean did an amazing job removing denim transfer. The seats don't look slick but it's easier to slide in and out of the seats now - so they feel and look very clean. I would put optimum at the top of the lost if I was working on a nasty car. I've mainly used Lexol on nappa leather but it stops there. The Audi leather did look and feel better with optimum and it is the lowest cost solution that works. However, the Sonax leather foam cleaned the Audi seat just as well and Sonax also smelled more like the factory smell. optimum power clean needs to be followed by optimum leather. If you have an Audi, I would go with Sonax but use optimum if a long time elapsed between cleanings. I've used probably every box store leather protectant, also 2 stage lexol, saddle soap, just for leather, surf city, meguires, auto magic with lanolin, etc. Pros: love how easy application is, the matte sheen and instantaneous improvement in feel. Also renewed that new appearance on the vinyl panels and smells clean and natural to me. I just ordered the big 120 ish Oz bottle as this is going onto the rest of our cars and any others I detail. Love it! Cons: I apply more than is needed to do the job but that's on me.